The society owns and operates several full-scale ships, the only society of our kind in the world to do so. One is a good thirty two foot long replica of the Krampmakken Boat, another a twenty foot copy of the Gokstad Faering. Both are capable of being rigged for sail and the Faering is frequently used in this way. We also own three Glass-reinforced plastic (GRP) hulls, each forty-seven feet long. Originally commissioned by the Jorvik Viking Centre as replicas of the Skuldelev Wreck Three, these vessels have now belonged to Regia Anglorum for many years. These too are propelled by oar and sail alone and we keep one in a state in which it can readily be moved from place to place. We frequently use these ships for film and events work and Rutland Water – the largest man-made body of water in England – is a frequent location. These are sometimes used at shows with a coastal, lake or river setting. 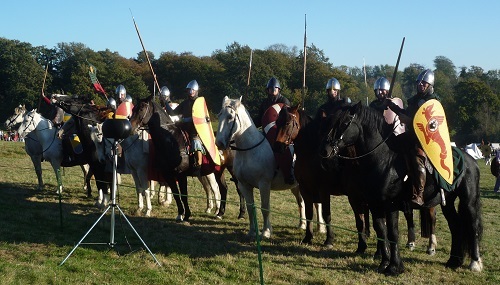 They are often used for filmwork too, and have been seen in such productions as Game of Thrones. 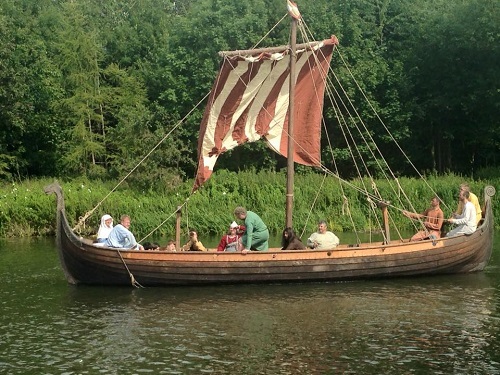 They give the society's members the chance to learn how to sail and row a 1000 year-old type of ship, and you never know what they may be required for next, or where! If you wish to be involved with the ships, or just require more information, then please contact the National Maritime Officer. Riding was a skill common to the nobility of Regia's period – whether just out hunting or hawking; resting on campaign or charging up the ridge of Senlac. The sheer height advantage gained when you are mounted makes the average Saxon Thegn or Norman Knight a commanding presence on the battlefield. The Bayeux Tapestry is full of images of men on horseback hunting, or riding down the Englisc shield wall. Byrthnoth himself at the Battle of Maldon rode about his men encouraging them before he dismounting and joining them in the shieldwall. Many of our people can ride, and some own their own horses. We are always looking for experienced riders to add to the team. All tack and equipment is re-created to the same high standards as all our other artifacts, including a period saddle. Religion was a major element in everyday life. Most of Europe was Christian by this time, with only a few pagan diehards left in Scandinavia. It is difficult to explain in a few words how important and influential the Church was to the culture and belief of the population as a whole. Much of our evidence for everyday life is taken from the various manuscripts and illustrations originally created by monks and other churchmen. Regia has all sorts of people interested in this aspect of life, and for all sorts of reasons. 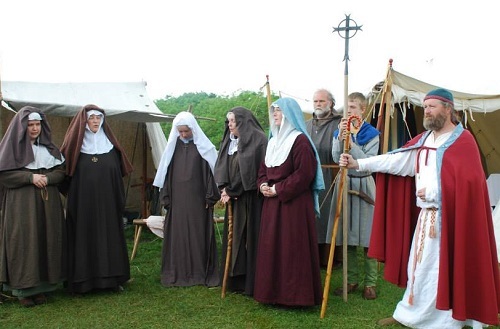 At events, we have a number of women portraying a group of nuns who sing in Latin. Other people take the roles of monks or other male clergy. From time to time, we might have a wedding ceremony in a church local to an event and our biggest ecclesiastical adventure yet is a full scale coronation in York Minster! If you would like to take part, or would just like to know more about what goes on, please contact the Ecclesiastical Officer.